Veteran's Day is a day to honor all those who have given their service to our country, and loads of retailers, restaurants, and online stores have special deals, discounts and freebies for veterans as well as active-duty military (and in some cases, spouses and immediate family can qualify too). We rounded them all up so you can spend less time searching and more time enjoying these little perks. And if you want to find even more deals and discounts on individual products, there are plenty of pre-Black Friday sales to take advantage of right now as well. Online stores and bricks-and-mortar stores also are showing them some love as well. To thank veterans and active-duty military for their service, stores will offer special discounts to individuals with a military identification. Many businesses may also accept discharge papers, Veterans Administration cards, and veterans organization membership cards as proof of service. Some savings extend to spouses and families and many military discounts are offered year 'round or on a regular basis. For online shopping, there's a different process for service members to get these discounts. Many retailers are using third-party verification services to confirm only eligible people are able to take advantage of these offers. Bed, Bath & Beyond: Get 25 percent off your entire purchase through Monday, Nov. 12 in-store only for veterans, active-duty personnel, and military spouses. Big Lots: Get an 11 percent in-store discount Sunday and Monday. Buckle: Service members can get 10 percent off purchases all year long but, but for Veterans Day, they can also get free shipping now through Nov. 20. Learn more at https://www.buckle.com/military. Buy Buy Baby: Get 25 percent off your entire purchase through Monday, in-store only. Food Lion: Get a 10 percent discount Monday with a rewards card and military ID for military personnel, veterans, and their family members. Fresh Market: Get 10 percent off all purchases Sunday and Monday. Kmart: Though Monday, the retailer has an “Unsung Heroes” promotion and is offering a 10 percent in-store discount for veterans, active military, first responders, teachers, police officers, firefighters, EMTs and nurses. Mattress Firm: Through Monday, get a 20 percent discount for veterans and their families, military, and first responders. Use the promo code "VETS20" to get the discount online. Sears: For a limited time, Sears is offering a military discount for active military and veterans of 20 percent off regular-priced merchandise and 5 percent off sale prices for tools and Lawn & Garden merchandise. Target: Save 10 percent at Target stores or Target.com now through Nov. 12 with verification. Some exclusions apply and online verification is required through SheerID. World Market: Get 25 percent off your entire purchase through Monday in-store for veterans, active-duty, and military spouses. These retailers offer discounts and perks for vets and active-duty military personnel all year long. Participation can vary by location and proof of military service is usually required. A.C. Moore: Get 15 percent off your total purchase, including regular and sale items, with a valid military ID every day. Advance Auto Parts: Get 10 percent off regularly priced items for in-store purchases for active-duty, reserve and retired status members, as well as all veterans receiving VA benefits, spouses, and dependent children up to age 18 with proof of military status. 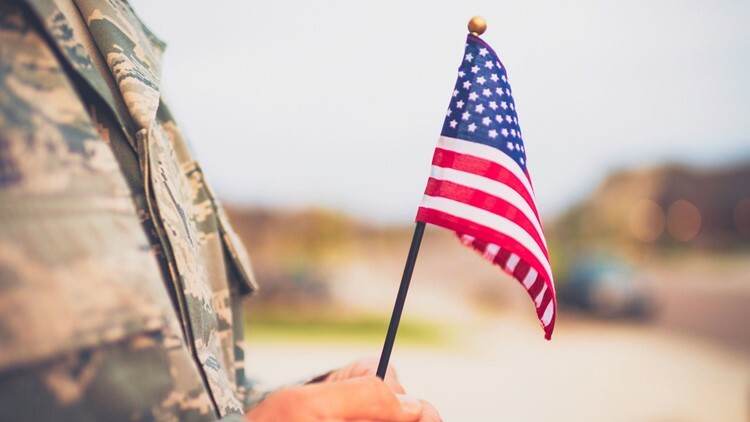 AT&T: Qualified active-duty military, reserves, National Guard, veterans, and spouses of active-duty and deceased service personnel can get 15 percent off monthly service charges on eligible plans. Bass Pro Shops: Military members can save 5 percent every day. Big 5 Sporting Goods: Get 10 percent off entire purchase for active duty, reserve military, retirees, veterans, spouses, and dependent children with military ID or veteran status on driver’s license. In-store only. Cabela's: Military members can save 5 percent every day. Champion: Save 20 percent on most online purchases after verifying military service at www.champion.com. Foot Locker: Save 20 percent on most online purchases after verifying military service on www.footlocker.com. General Motors: Military get discounts on new GM vehicles, as well as other cash offers. Learn more about the GM Military Discount program at www.gmmilitarydiscount.com. Hanes: Save 20 percent on most online purchases after verifying military service at www.hanes.com. Home Depot: Active-duty military, National Guard and reserve, retiree, and disabled service members and their spouses, get a 10 percent everyday discount. Joann Stores: The arts and crafts store offers a 15 percent year 'round discount for military service members and their families. Lowe’s: Get 10 percent off eligible purchases every day for active military personnel and veterans. Enroll at www.lowes.com/military. Michaels: Get 15 percent discounts for military families every day. Nike: Active, veteran, retired and reservists, spouses and dependents of active personnel get a 10 percent military discount at Nike.com as well as in Nike, Converse, and Hurley stores. To get the discount online, verification of eligibility is required. You'll need a military ID to get in-store savings too. Old Time Pottery: Get a 10 percent military discount every day for active, retired military and their immediate families. O'Reilly Auto Parts: Get an in-store discount of 10 percent off the retail price of most items for active duty, reserve members, retired service members, and veterans with valid ID. Immediate family members of active duty or veterans are eligible for discount if they have a government-issued dependent ID card (DD form 1173 or 1173-1). Pep Boys: Get a 10 percent discount every day for active and retired military with valid military or veteran ID. Rack Room Shoes: Get a 10 percent military discount on Veterans Day and every Tuesday throughout the year with a valid military ID. Sam’s Club: Through Jan. 31, when active and former members of the U.S. military and their spouses join this membership club in-store or online, they get a free $10 gift card. To redeem this offer in-store, print out the offer details from the Sam’s Club website. Proof of service is required. Sherwin-Williams: The company offers a year 'round 15 percent military discount for active military and veterans reservists as well as their spouses. T-Mobile: The military plan offers 50 percent off family lines for all military and veterans. Learn more at www.t-mobile.com/military. Verizon: Get $15 off select plans or 15 percent on other eligible plans. Learn more at www.verizonwireless.com/military. Local deals: Locally owned businesses and regional chains may have free meals and discounts for military. One of the easiest ways to find out is to check restaurants' social media channels (or just give them a call and ask). More discounts: Find additional discounts including at hotels and other online retailers at shop.id.me/military and www.sheerid.com, two verification sites. Another option is Veterans Advantage, which offers a one-month free trial. Learn more at www.veteransadvantage.com.